Made by Samuel Leigh in Greater London, England, c 1880. Card game, ‘Urania’s Mirror or a View of the Heavens’, cardboard, made by Samuel Leigh, London, England, c. 1880. Card game consisting of 32 cards of astronomical figures, in original box. 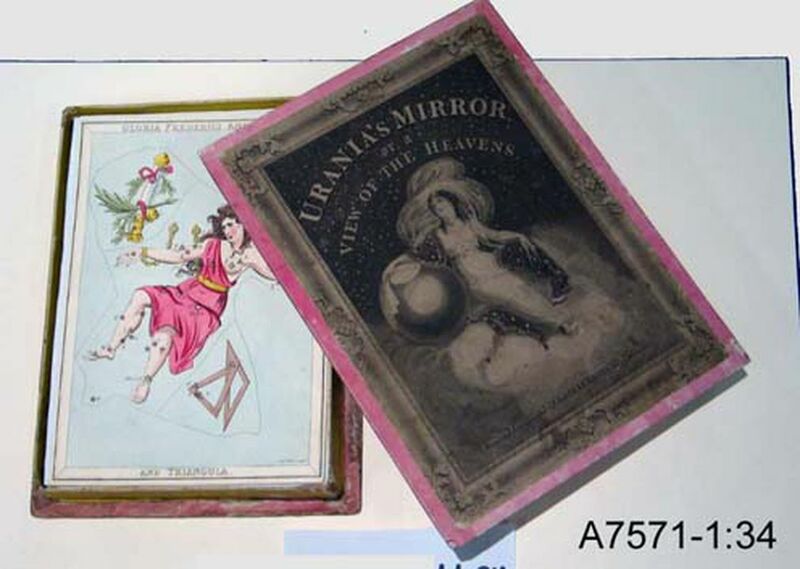 Card game, 'Urania's Mirror or a View of the Heavens', cardboard, made by Samuel Leigh, London, England, c. 1880. Heavy cardboard box covered in pink paper, cloth corners, engraving on lid has image of a classically dressed woman sitting on clouds, a large sphere under her right arm, flowing mantle and scarf decorated with stars. Figure holds a drawing divider in her left hand, stars in a night sky behind. Banded border decorated with cartouches and acanthus leaves. Black and white printed frieze of classical Greek style theatre masks adhered around all four sides of lid. Inside box covered in yellow paper. Cards are coloured and include depictions of Taurus, Orion, Pegasus, Hercules, Pisces, Sagittarius, Scorpio, Aries, Aquarius, Gemini, Virgo, Libra and Cancer. Samuel Leigh, London, England, c. 1880.